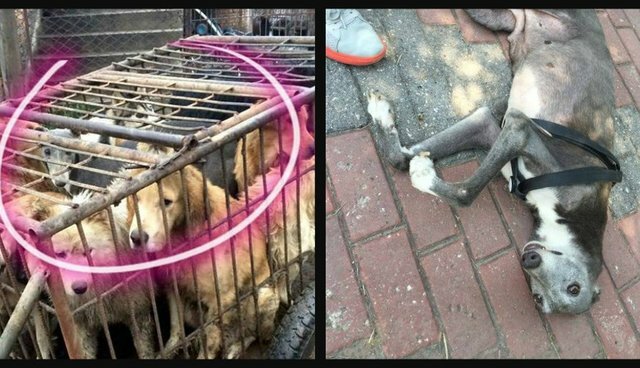 Hui Hui, a senior greyhound, was on her way to slaughter in Mudanjian, China, when she and over 100 other dogs were saved by a rescue operation. 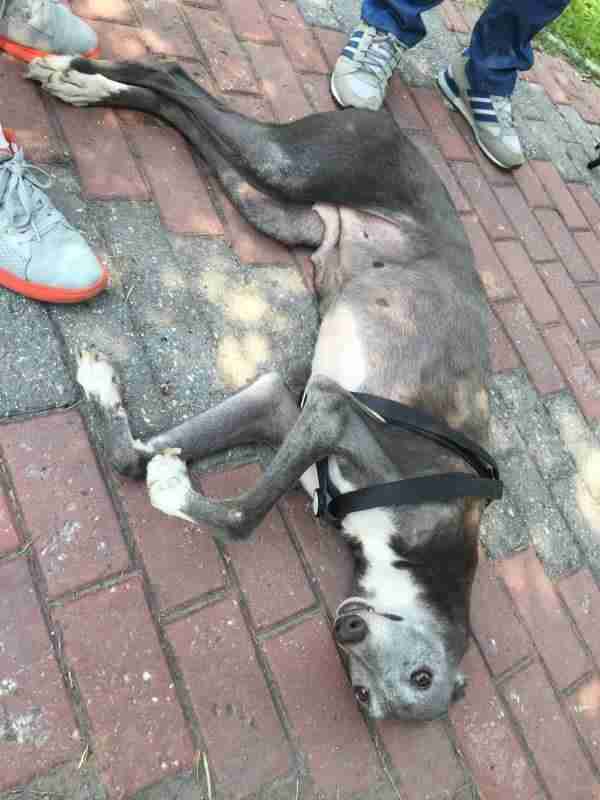 Hui Hui stood out from the pack as the sole greyhound and she was very clearly injured, likely during transport. 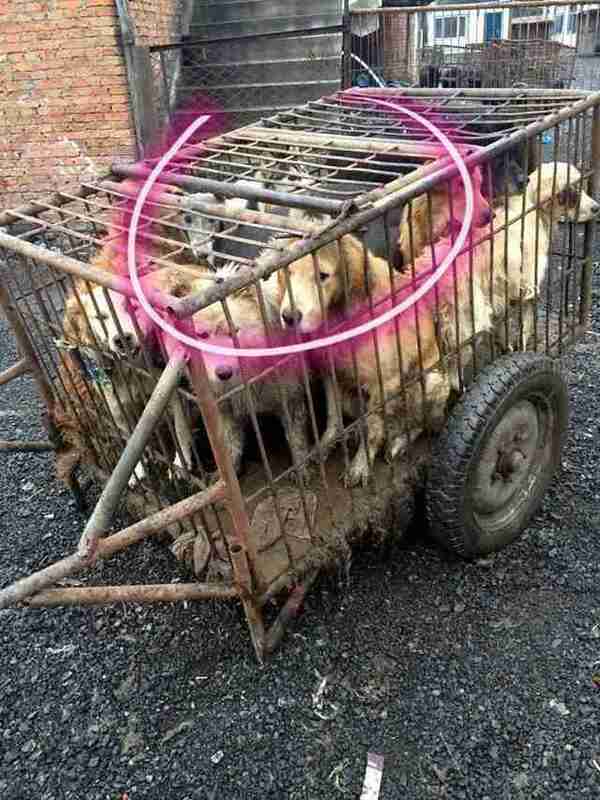 Now, Hui Hui is going to get a second chance in the U.S.
Every year, 10,000 dogs are killed during China's Yulin dog meat festival and millions of dogs are butchered for the dog meat trade. In some circles, those involved with the trade believe that the worse the animal is tortured, the better the meat's flavor will be. Disgusting details like this are only the beginning of this horrible reality. It's unclear what Hui Hui's early years held before she was taken by the trade, but, sadly, she might not have been much better off. 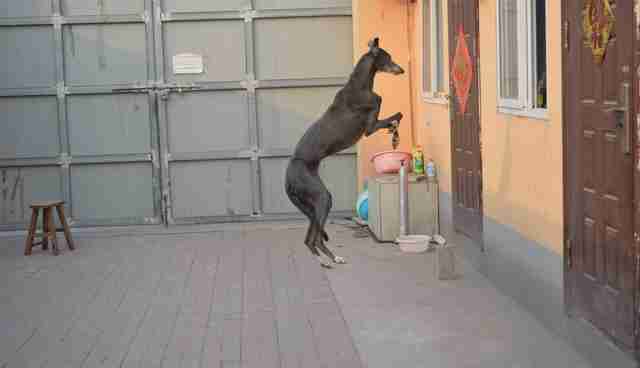 "There is the possibility she could have been sold to the dog meat market after being used for hunting or breeding," Steven Anderson of 4 Greyhound Racers told The Dodo. "However, she could also very well have been someone's pet, as many of the dogs that are slaughtered are pets that are stolen from their owners." Hui Hui and many of the other dogs rescued with her were brought to the Tangshan City Small Animal Protection Association, where Hui Hui's injury was assessed. As an older dog with an injury, it was highly unlikely that Hui Hui would be adopted in China, unfortunately. It was even possible that Hui Hui might not survive the surgery if she was kept in China, so her supporters began the process of raising funds to send Hui Hui to the U.S.
Now, thanks to those generous supporters, Hui Hui is slated to arrive in the U.S. on September 30 with her foster dad Yu Hang who will make her transition easier while she adjusts to her new foster family. Once Hui Hui is in the U.S. and placed with her foster family, it will take some time to determine when she is well enough to be adopted, however. 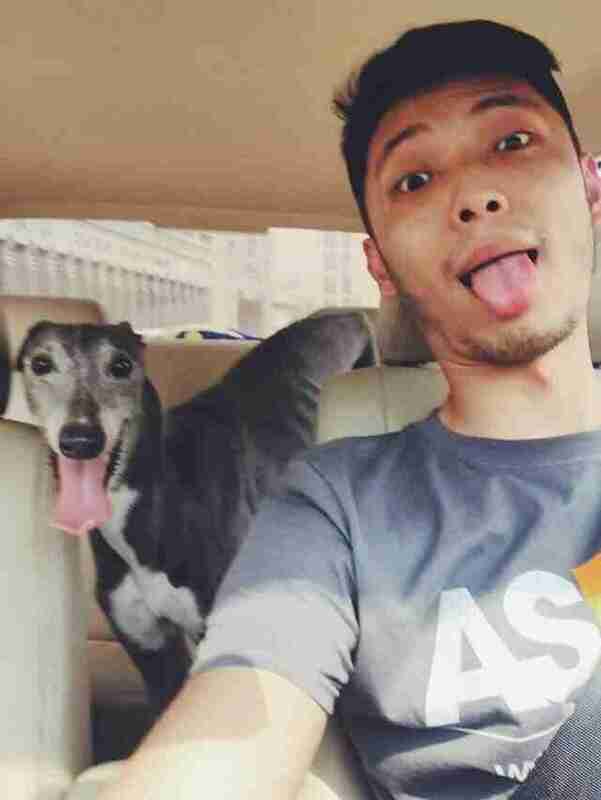 "Our group, 4 Greyhound Racers, is foster-based so Hui Hui will be with one of our foster families when she arrives in Chicago," Anderson said. "From there, she will have her leg further evaluated and hopefully rehabilitated. Then, after she recovers, she will be homed through our adoption program. A lot will depend on what is wrong with her leg, if and how much we can do to help mend it, and how long the recovery takes." Hui Hui is sadly just one of many victims of the dog meat trade that needs help. The Duo Duo Animal Welfare Project is another organization fighting tirelessly to stop the dog and cat meat trades overseas. To keep up to date with Hui Hui and her journey to recovery, follow her Facebook page.